You may still be able to book by calling the hotel at 216-377-9000. 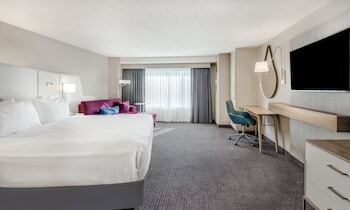 If simplicity and comfort are what you look for when traveling, then the Radisson Hotel Cleveland – Gateway may be right up your alley. Each room features a number of great amenities like complimentary high-speed Internet access and cozy furnishings. You’ll also rest easily on the Sleep Number bed, which allows for individual control over the firmness of the bed, and sports crisp white sheets and a feather duvet. Guests also enjoy access to the hotel’s fully equipped business center and fitness room, as well as free entry into Fitworks at the Colonial Marketplace. And since the hotel is centrally located, you’ll find great attractions right next door, such as Progressive Field (which is right across the street), the House of Blues and Playhouse Square. You’ll never look at Cleveland the same way after a stay at the Radisson. Radisson Hotel Cleveland Gateway is a 3-star hotel located at 651 Huron Rd E, Cleveland, OH 44115, US . Its nightly price usually falls between $81 per night and $399 per night, excluding tax, depending on room category. 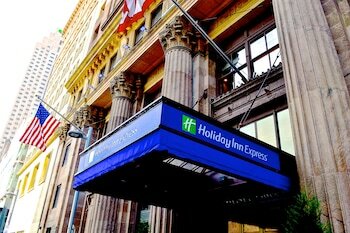 At Radisson Hotel Cleveland Gateway, AAA members often get 7-13% off the regular rate. For example, on December 29, 2018, a AAA rate of $98.1 per night was offered. Depending on your itinerary, your savings can be more than the annual AAA membership fee itself! Many Room 77 users are able to pay for their entire AAA membership in a single stay. 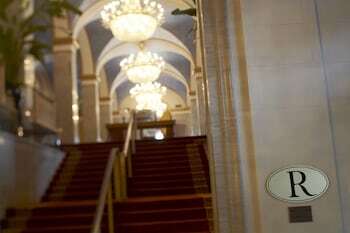 At Radisson Hotel Cleveland Gateway, seniors often get 5-10% off the regular rate. For example, on December 29, 2018, a senior rate of $98.1 per night was offered. $81 per night found for a Room, 1 King Bed, Accessible, Non Smoking room type. For December 29, 2018, a special AAA rate of $98.1 per night was found for the AAA-CAA Rate - 2 Double Beds-Non Smoking - -Special Rate For AAA-CAA Members-ID Required room type. For January 9, 2019, a special Senior rate of $98.1 per night was found for the Senior Breaks - 2 Double Beds-Non Smoking - -Special Rate For Guests 60 and Over room type. Radisson Hotel Cleveland Gateway sells rooms through sites like Room 77, Expedia, Hotels.com, GetARoom, and many others. Room 77 searches across dozens of different sites to find the lowest discount rates available. The lowest rate we've seen over the last few weeks was found on . In 1% of the cases we surveyed, all sites offered the same rate. You can compare real-time rates from all of these sites on Room 77. Room 77 is the only hotel shopping site that includes special discounts like AAA, senior, government, military, and corporate rates.